Here at UB, our passion for rigorous research is matched only by a deep commitment to positive change. 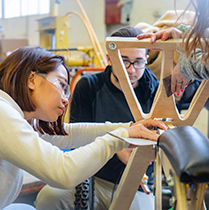 Our talented students and world-renowned faculty ask difficult questions, push past accepted boundaries and break ground to lead a new way forward. These are just some of the stories that show how. To better understand why some lava-water interactions turn explosive and some don’t, scientists are making their own lava and blowing it up. A preclinical study led by UB researchers raises the possibility of one day restoring memory function in Alzheimer’s patients. Prescription antidepressants are building up in the brains of bass, walleye and other fish common to the Great Lakes region, carried through household wastewater. The environmental risks have scientists concerned. Illicit use of Ritalin as a ‘harmless’ brain-booster may in fact be causing irreversible damage to young people’s brains. A new study reveals that the reported benefits of breastfeeding could be influenced by characteristics of the mother, such as what she knows about health and nutrition. New research reveals that the harmful effects of binge drinking are compounded by the unhealthy eating that often follows. UB faculty and students are applying knowledge to solve complex global challenges through research.